The last few months have been exciting for the presentations team. In January, we added shapes and "Save as PDF" and just recently launched "Save as PPT". Today, we have two new features to tell you about. Seasoned presenters keep their slides simple and use slides to help illustrate their points, not to present all of their information. They jot down their talking points, examples, and supporting evidence in speaker notes. To help you do do this in Docs, we've added speaker notes. 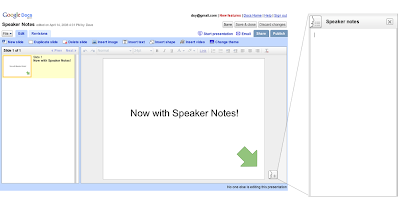 You can print these speaker notes in advance, or pop them up in a separate window when you present. Videos can help you make a point, command the attention of your audience, or even add humor to your presentation. Now in presentations, you can insert one or more YouTube videos onto your slides and play the videos while you're presenting.